Here begins a series of blog entries undertaking to examine each of the eight qualities that our Great Mother advises us to cherish in our hearts. This oft-repeated phrase was rebooted into popular vocabulary by its reference as most of the title of a surrealistic episode of the Twilight Zone (1960), “Eye of the Beholder,” almost a century after it was first framed in these words in a 1878 tale by an Irish romance novelist (Molly Bawn, Margaret Wolfe Hungerford). The sentiment goes back to Shakespeare and millennia further back into ancient Greece. To explicate the phrase, beauty is a subjective judgement made individually. Our society thinks of beauty, first of all, as a trait of the female of our species. Today, supermodels, from 1960s’ Twiggy to 1990s’ Imam, are held up as “beauties.” Historically, women in power are regarded as role models for fashion—Queen Elizabeth I (“Good Queen Bess”), nicknamed Gloriana, overturned female styles from the dark hues and blocky silhouettes of Queen Mary Tudor, her predecessor, to the whites and pale tints, lace trims & ruffs, and floral decoration throughout her reign, bringing a brightness into fashion. In today’s world, beauty is made cheap. From glamour and fashion magazines of the past century to today’s reality television shows, ordinary humans are “discovered” and made famous…at least for their allotted 15 minutes of fame. In these fora, human physical attractiveness is valued higher than almost any other human quality, mental or physical—exposing such “beauty” as very nearly valueless. Empty beauty becomes a goal in itself, or a tool to enable instant wealth or fame or both. And advertisers tout everything from the lowest-cost cosmetics to the highest-cost cosmetic surgeries in these same media. Many dictionaries resort to defining such words with a synonym for the word, making it easier on the compilers but much harder on the readers who may not know the meaning of the synonyms any more than they knew the word they looked up. An example of such definitions might lead to beauty: handsomeness: attractiveness: charm: charisma; glamor; beauty—a circular puzzle with no definition. So, looking at the definition as simply as possible, beauty is the aspect(s) of anyone or anything which pleases the senses or the spirit. Beauty lifts human hearts or souls; it attracts our eyes, ears, noses, mouths, or hands by giving pleasure. 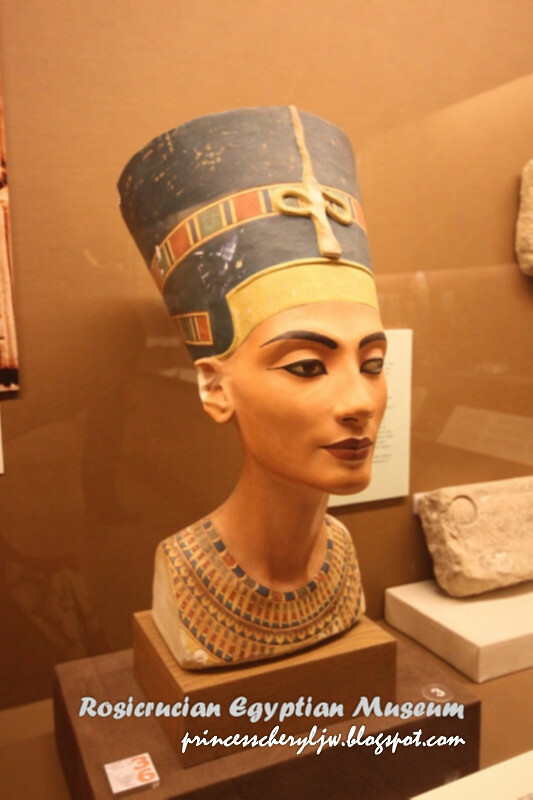 The word beauty supplanted the pre-Conquest word wlite (Old English/ Anglo-Saxon), defined as beauty or splendor. Splendor, shining, brilliance—all of these qualities are cherished in the world around us. Sunsets and sunrises, rainbows and moonshine, mountainous vistas reflected upon still and moving water, brilliant swathes of spring wildflowers—all of these are among what we call beautiful. 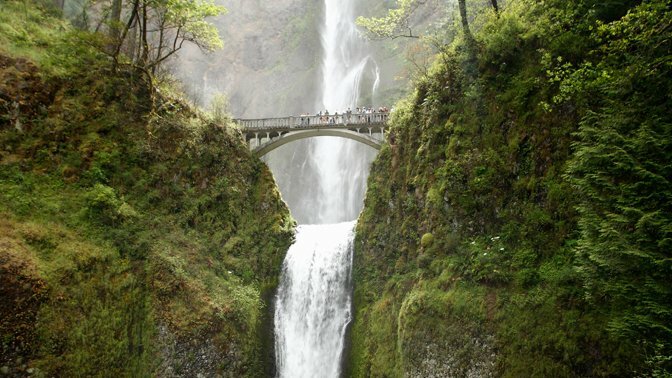 As interest in natural history arose in the 18th century, the term “picturesque” came into use, referring to natural vistas worthy of being painted. Young ladies of rank were universally educated in drawing and watercolors to record images and scenes for themselves and others, similar to the way the Kodak Brownie camera enabled early 20th century families to collect snapshots of people and places, just as smartphones and digital cameras enable today’s youth to populate such web sites as Shutterfly, Flickr, and Pinterest with places and people and events. The 18th century UK landscape at left contrasts with the US photograph at right, at the same time as they are both picturesque. 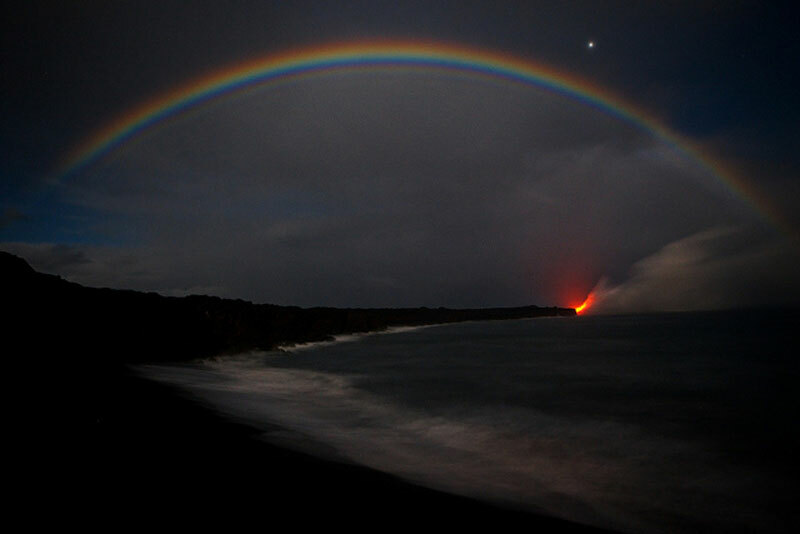 Both have qualities of light that attract the eye, that glow or shimmer or shine. It is not only landscapes that draw our eyes in this way. Beauty, here is set in contrast to Strength, with the “middle pillar” being Wisdom. Freemasonry terms these upright pillars—Beauty, Wisdom, Strength—as “the pillars on which the lodge stands,” so intrinsic a foundation principle of Masonry that these pillars are referenced in esoteric Western traditions of every sort. 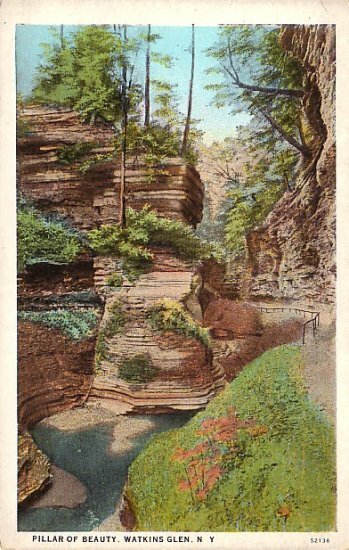 In the 18th century North American British colonies, a great many of what today are called America’s “founding fathers” were Freemasons; one can only presume that such a Mason named the physical feature in New York state called the “Pillar of Beauty” (illustration, vintage postcard, right). Tarot’s major arcana or greater trump cards comprise a total of twenty-two card (numbered zero through twenty-one), mirroring the 22 pathways among Tree of Life. Given that these trionfi cards, as they are known in the earliest surviving tarot decks (such as the Visconti-Sforza), it is not known with any certainty whether the greater trumps number 22 for that reason, or for some other. The kabalic references depicted in more modern tarot decks, such as the Rider-Waite or Universal Rider decks, derive from esoteric teachings that associate the greater trumps with the kabala over the prior century and more. 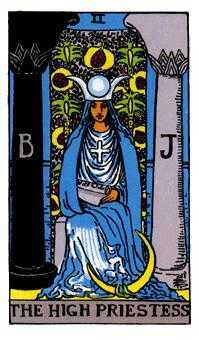 The Tarot’s High Priestess card (number II of the greater trumps) traditionally depicts the High Priestess seated between the Pillar of Beauty and the Pillar of Strength—implicitly displaying the High Priestess herself as the Pillar of Wisdom. 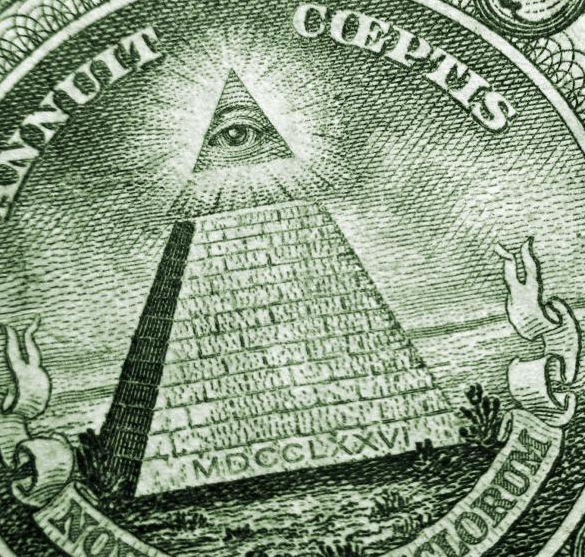 Masonic symbols appear throughout our U.S. symbology; even today the “all-seeing eye” or the Eye of Providence (a common Masonic symbol) appears above an unfinished pyramid on the obverse of the one-dollar banknote printed by the U.S. Mint. This classic quote speaks to the quality of beauty that transcends surfaces and the modern insistence on youthful appearance. Donne uses the word grace to evoke in his reader’s minds the qualities that embody the inner beauty of wisdom, courtesy, kindness, goodness, nobility, and so on. True beauty is found in the spirit, and shines for all to see. When the Goddess tells us to have beauty within us, She evokes this greater beauty which benefits each of Her hidden children for themselves—and also for everyone else around them. 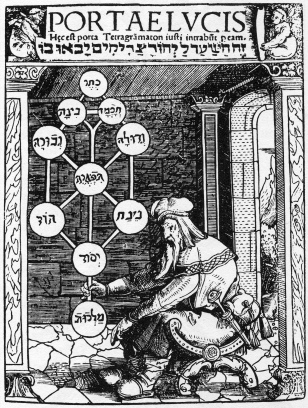 The Wiccæ know (as do all wise magic-users) that knowledge begins within; Pythagoras’ mandate Know Thyself is the first instruction to any magician. Thus, we all are charged to seek out one’s own “beauty within” and to cherish its growth in each of us. This entry was posted in About Wicca, British Traditional Wicca, Initiatory Wicca, Paganism, Wicca, Witchcraft and tagged Goddess, Wicca, wiccan virtues on May 17, 2016 by Deporodh.